This fine line engraved frontispiece was executed by Robert White (1645-1703), a prolific artist, who was primarily a portrait engraver. 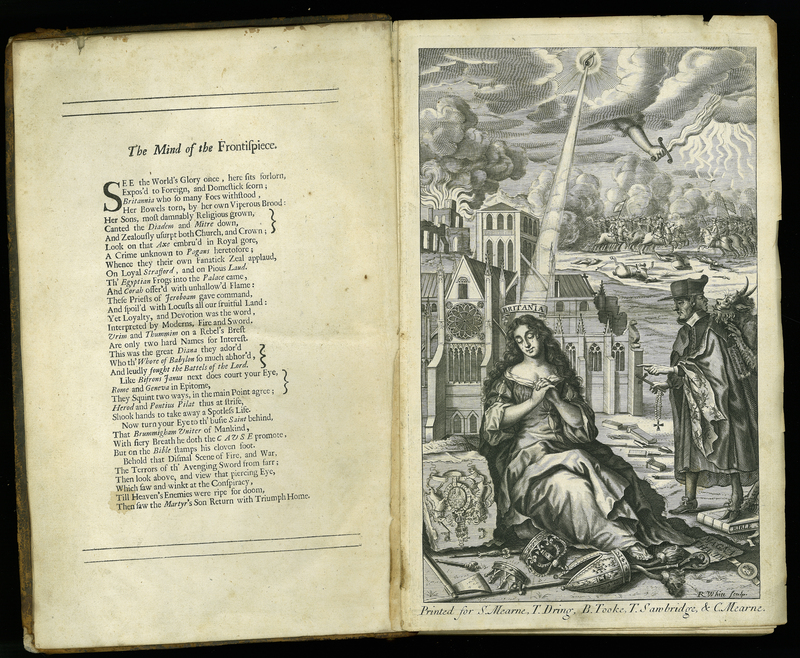 Although readers of this book would have understood the meaning of the emblems and symbols used, there is an accompanying poem ‘The Mind of the Frontispiece’ that hammers home the perceived calamity and chaos in England up to the beheading of King Charles. Depicted are Janus-like priests, a cloven foot stamped on the Bible, a mitre, crown, and diadem (all representing regal power or dignity) thrown to the ground, the Royal coat of arms upside down, and a ‘forlorn’ ‘Britania’ (sic) crying. The only thing missing in this elaborate frontispiece are the Egyptian Frogs! John Nalson, “An Impartial Collection of the Great Affairs of State, from the Beginning of the Scotch Rebellion in the MDCXXXIX. to the Murther of King Charles I,” ourheritage.ac.nz | OUR Heritage, accessed April 20, 2019, http://ourheritage.ac.nz/items/show/10675.